If you enjoy having light, elegant and beautiful vintage looking style in your house, and specifically in your kitchen, you may want to consider French country decor, which is an embodiment of all these qualities. The inspiration for this decor comes from nature and French rural life. A great trick to creating this decor in your home is using different materials, such as wood, stone, natural fabrics and metal, which should never be shiny or very modern looking in such interiors. Another important element of country decor is incorporating different textures, making everything look a little bit worn-out, even the tiles should never look perfectly smooth. Because of the country roots of this style, flowers play a key role in creating a special country atmosphere in your kitchen. Another important detail of French country kitchen decor is, of course, the color. The main colors in the interior have a certain sense of warmth to them, which creates a very comforting and relaxing environment. The brightness can be added by colorful accents – paintings, patterned plates, jars, flower pots or any other item that will bring your kitchen to life. A widely used symbol of this country decor is a rooster, which can be represented in pictures or figures and also help bring an element of interest to your space. 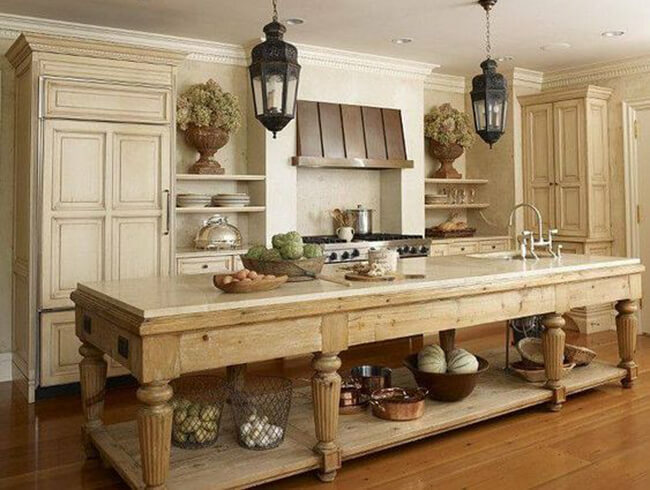 French country kitchen decor will certainly be an amazing choice for people, who value traditions, calm simplicity and grace.